If there’s one thing I’ve learn from the French, it’s how to create that effortless chic look. You must make it seem like you didn’t put in much thought into your entire outfit, even if you spent the previous night fretting about what to wear. You can’t overdo it, so the number of statement pieces that you have must be limited to one, if any at all. Your overall look must be too casual for a formal dinner and too stylish for a simple caffeine fix. Basically, you’re the in-between. Have something that stands out in terms of the quality or texture, or something that is rare. The rest is just how you match it. The same goes for your jewellery, the finishing touches to your entire look. I’ve been quite into layering my necklaces recently, especially after I got a really cute sterling silver lotus pendant from Thomas Sabo (whose SS 2017 Africa Collection is gorgeous). Layering my necklaces allows me to add different dimensions to my jewellery and spin stories, each of which is inspired by a different jewellery piece. The main trick to staying presentable is to always keep the pieces simple, and the colours cannot clash with one another. I usually decide what jewellery to wear based on the colours of my clothes and the neckline of my top. For example, if I’m wearing a V-neck top, that would allow for a longer pendant necklace that would end somewhere above the cleavage. For a top with a boat-neck or normal round-neck collar, any simple pendant necklace will work. 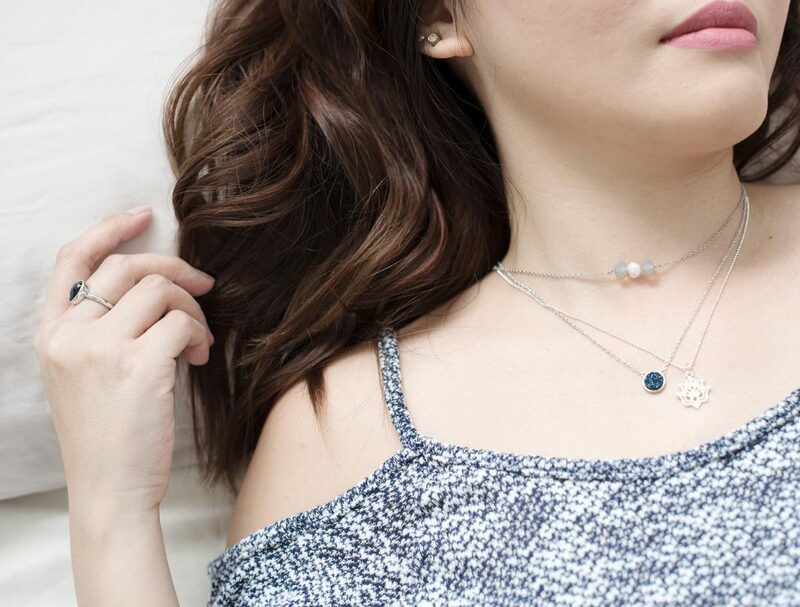 I quite like dainty necklaces because they also go well with T-shirts and denim – my daily staple. And because the ones I have on in this post have quite neutral colours, they will look good with any coloured top. The last thing to note when layering your necklaces is that you should never wear more than 3 at one go. Anything more than that is too much and gives the impression that you can’t make up your mind. I hope today’s post helps. You can shop my necklaces on Trouvée.Co if you’ll like to give this styling technique a go. Happy layering! French Friday: How to Layer Your Jewellery for an Effortless Chic Vibe was last modified: February 21st, 2017 by Roxanne C.